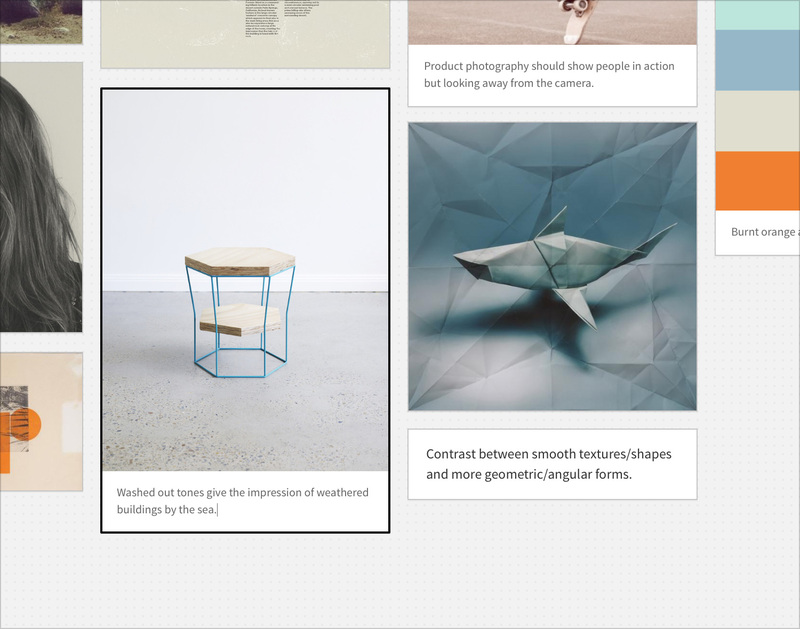 Milanote lets you create beautiful, shareable moodboards in minutes. The following step-by-step guide will lead you through the process of creating your own moodboard in Milanote, for free. In this guide you'll learn a new approach to a classic technique. 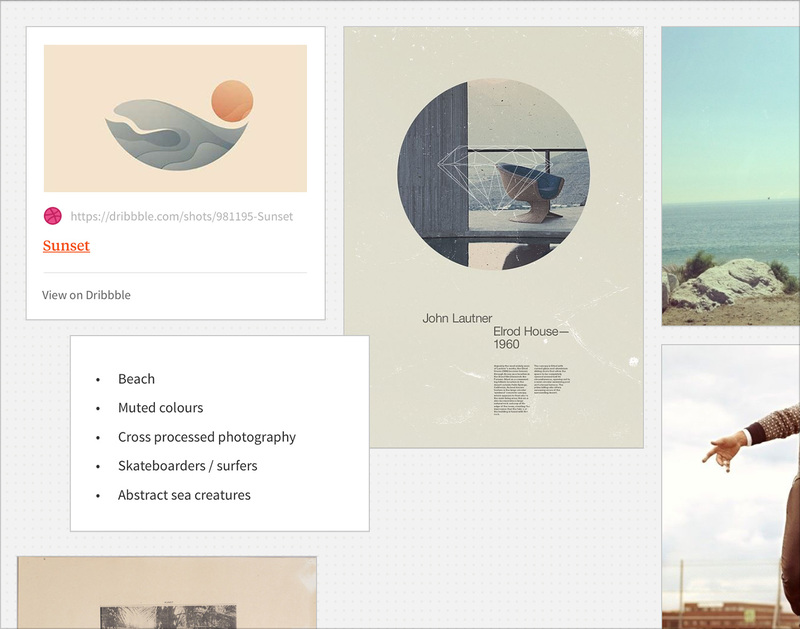 Moodboards are a great way to set the visual direction for a project, but they don't need to be static PDFs any more. 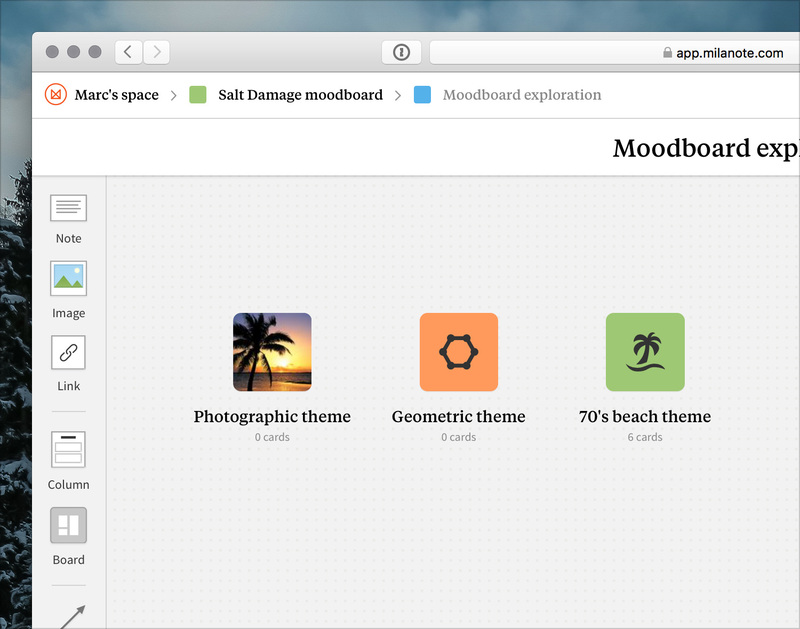 Modern moodboards can include video, motion or even sound. You can easily share them online with your clients and your team to get feedback. And instead of sitting in a folder gathering dust, they can stay flexible and can evolve over time. 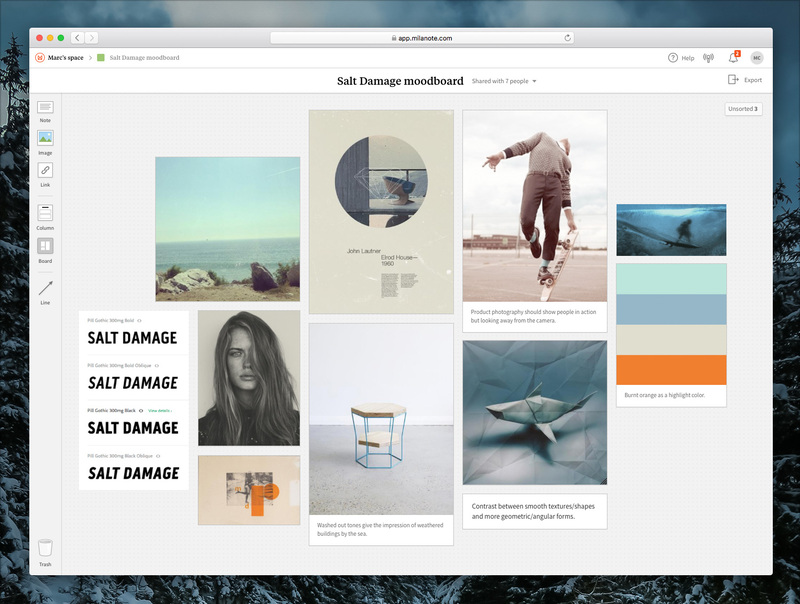 We'll guide you through the process of creating incredible inspiration boards in minutes using Milanote. Moodboards fall into several broad categories. They can either be literal and practical (i.e. featuring fonts, color schemes and images that you actually plan to use in a final piece of work) or they can be less literal and more about exploring tone and mood. You can tackle these two different types sequentially, or you can just do one or the other. Drag a new Board in from the toolbar. Name the Board based on what you're trying to achieve (e.g. "early moodboard" or "final brand board"). Set an icon that represents the Board. At this point you probably have a few different directions you'd like to explore. This is good! It's important to keep an open mind about what the right solution might be. Remember, a moodboard is all about exploration, so don't get too attached to a particular direction just yet. Open the first Board you created. Drag in sub-boards, and name them in a descriptive way. Before you start adding images, it's a great idea to collect any written content you have. This might include brand values, positioning statements, taglines or any other parts of the brief that will inspire you or keep you on track. 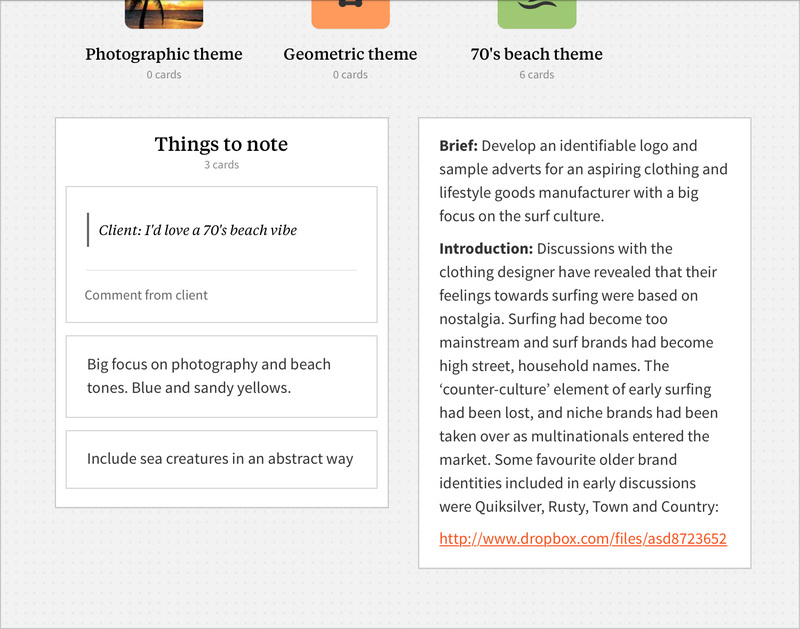 Drag in one Note from the toolbar for each piece of content. Use the Quote style for any direct quotes (e.g. from a client). Group the notes using a Column to make them easier to move around. Now it's time to start adding visual elements. Start with the easy stuff. If a logo already exists, drop it in. Same goes for any existing expressions of the brand like websites, design elements or photography. These might not make it into the final board, but they're still a great place to start. Don't worry about organizing the images just yet, that will come later. 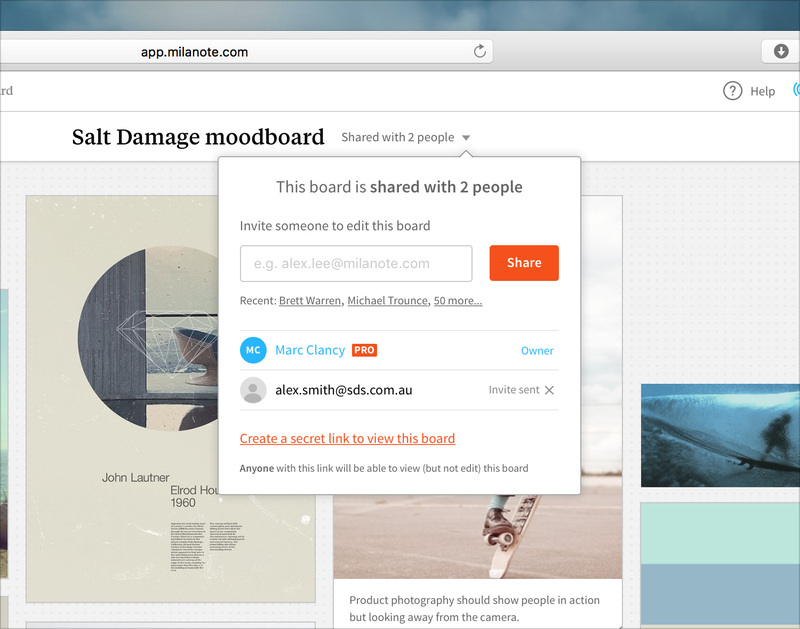 Drag and drop images from your desktop on to your board. Paste the URLs of images on the web into a Link card and they'll automatically be uploaded. Next it's time to start searching online. There are lots of fantastic sites where you can find great visual inspiration for free, like Dribbble, Behance and Designspiration. 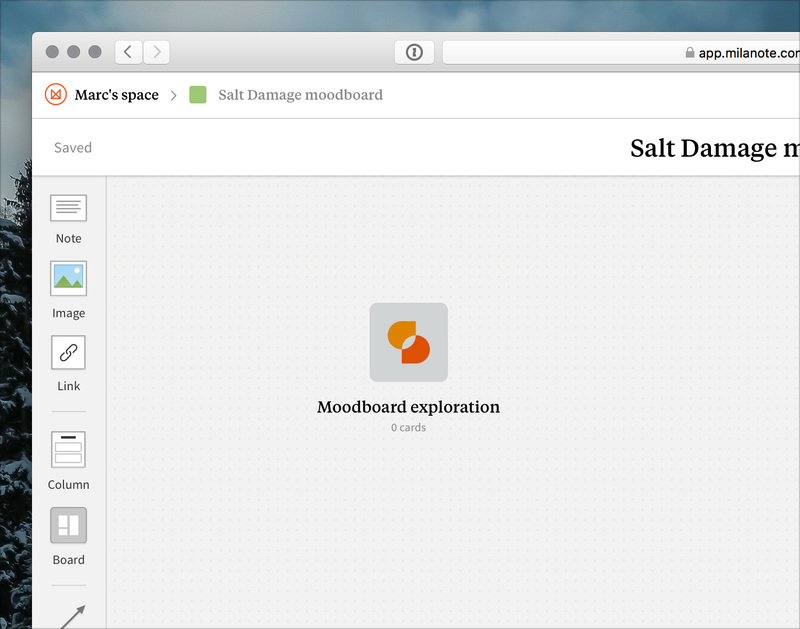 The keyword you use to search can be literal words describing the topic of the moodboard (e.g. "bicycle") metaphors (e.g. 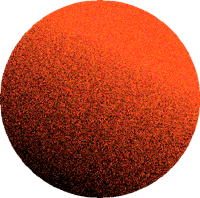 "ribbon") or descriptive (e.g. "clean"). Drag in a new Note to keep track of your search terms. Search the web for images which match your keywords. When you find an image you like, drag it straight into Milanote (or paste the image URL into a Link card). Websites like Pexels, iStockPhoto and the Creative Commons search are great places to find free photography. 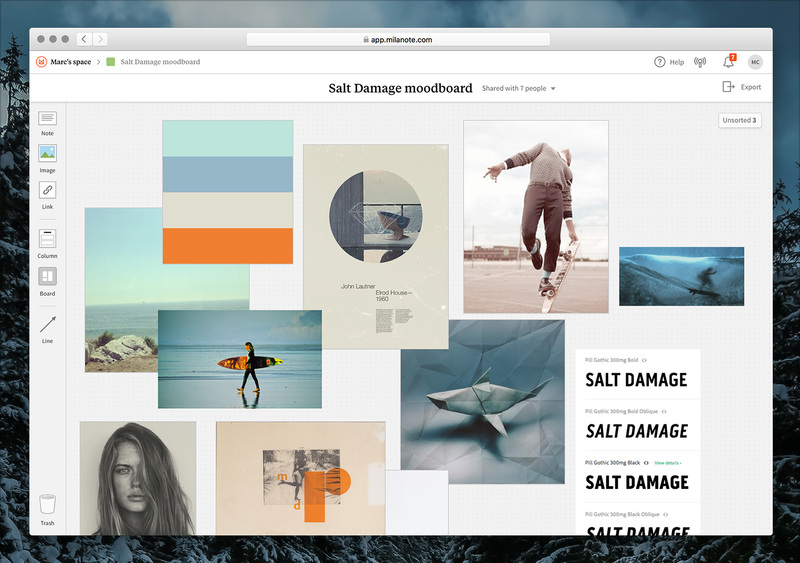 You can also use the Image Search feature within Milanote to find great images for your moodboard. The photos you choose can start to define things like tone, cropping, lighting and color. You can also start to decide whether photography should contain people, who they should be and what emotions they should be expressing. When you find an image you like, save it to your desktop. Once you're ready, you can drag and drop all the images you've found into Milanote to add them to your Board simultaneously. Use Image Search to find great images without leaving Milanote. 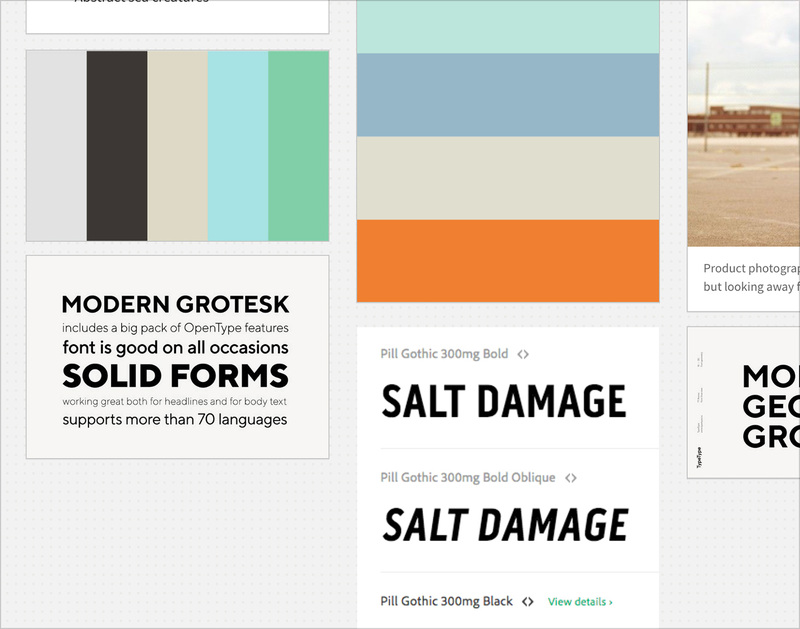 Color palettes and fonts can be a great way to express a particular mood or personality. Tools like Kuler can be a great starting point for finding colors that complement the brand you're working with. Another trick is to pick colors directly from the images and photos you've added to the board. Take screenshots of the color palettes and fonts you find online, or drag Font Files that you've collected to add them to the Board. Make sure you include different weights of the same font. 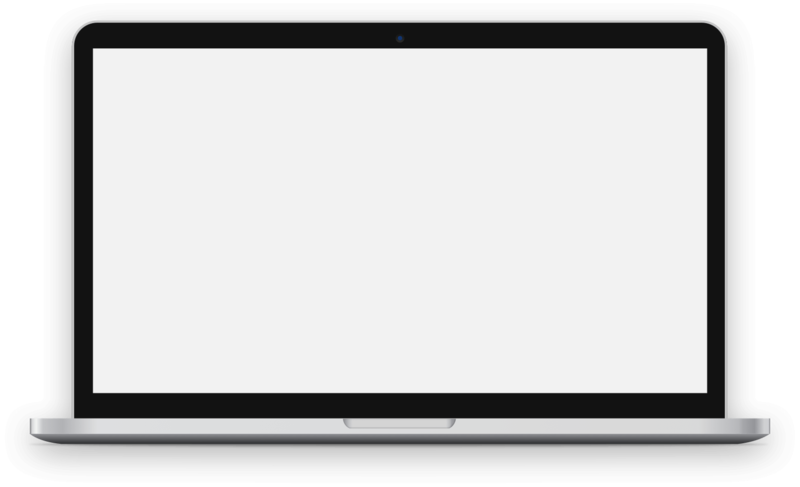 Drag your screenshots into Milanote to add them to the Board. 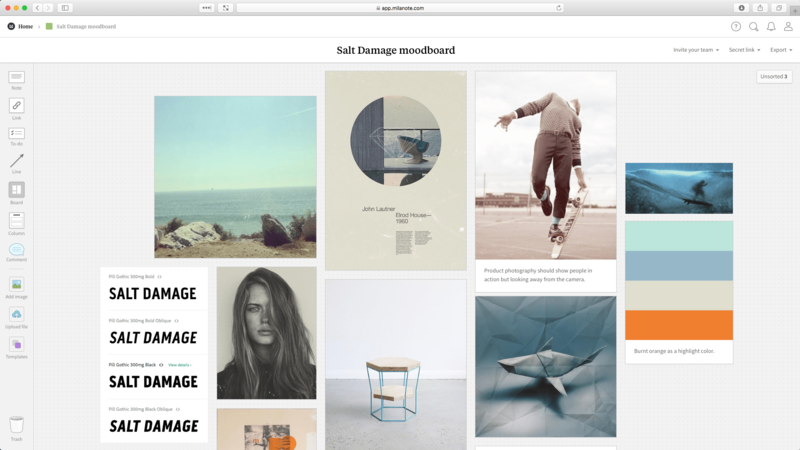 The days of static moodboards are gone. With an online board it's possible to embed examples of how movement and animation could contribute to a piece of creative work. Grab some animated GIFs from Giphy and video from YouTube to bring your board to life. 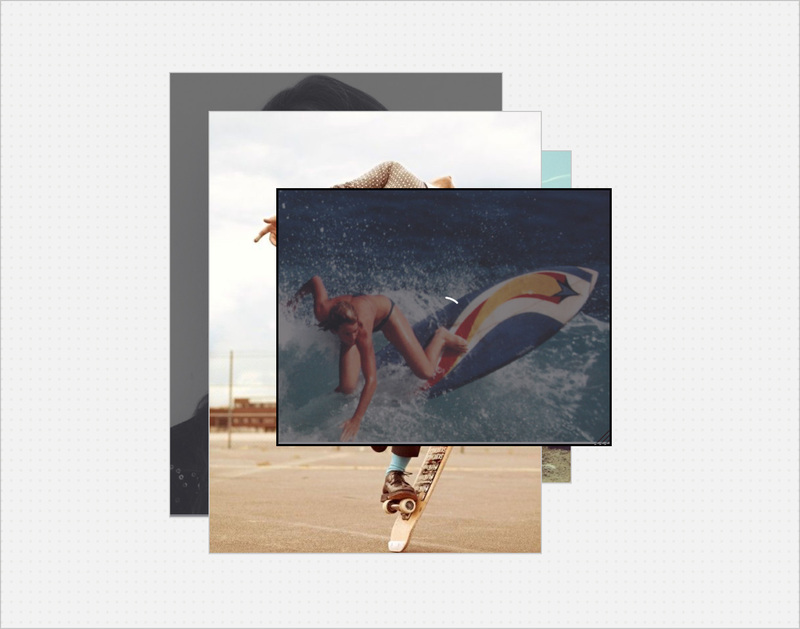 Drag animated GIFs straight from your desktop into your Board to upload them. Select and image and use the Transparent option in the toolbar to toggle the background on and off. 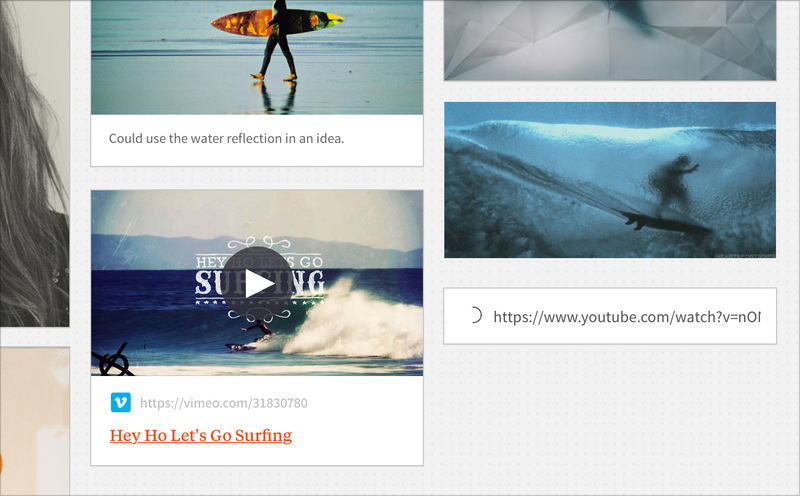 Use a Link card to embed video from YouTube into your board. Now that you've got the raw pieces, it's time to start arranging them into a final composition. 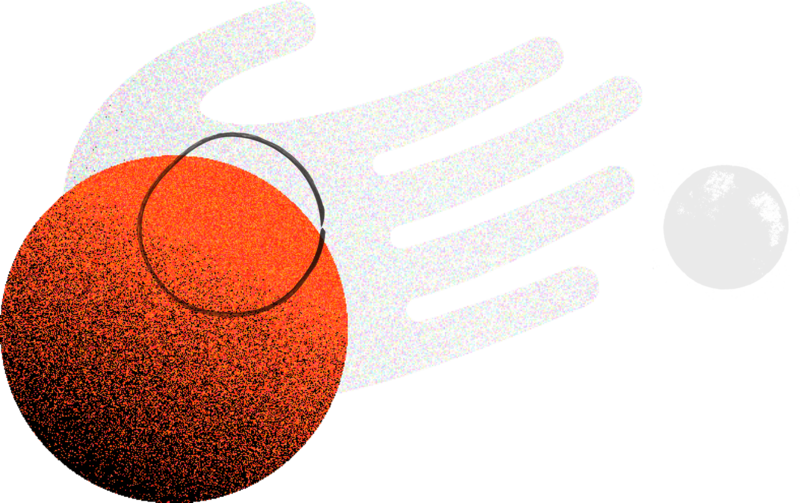 Starting by scaling and placing the logo can be a good way to anchor your composition. Use the size of elements to indicate their importance, and put related elements side by side. This process can take a while, so just relax and enjoy it! Drag any card to reposition it on the Board. Click and drag on the canvas to create a rectangle which lets you select and move multiple cards at once. 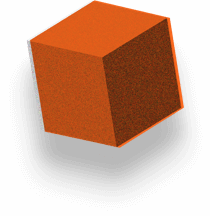 Drag the bottom right corner of an Image to resize it. Delete anything that doesn't fit by selecting it and hitting the delete key. Although a moodboard is a piece of visual communication, it's going to need some explanation before it will make sense to someone else. Adding short notes about why certain elements were chosen can really help communicate your ideas. Embedding these notes in a board keeps everything in context. Select an image and choose Caption from the toolbar to add a description (or just start typing to add a caption automatically). Choose Lock from the toolbar to force an image to stay behind everything else. Drag in text notes to add extra explanation. Now that your board is finished, it's time to get some feedback. There's nothing like a moodboard to kickstart a conversation with your team or your clients about what's working and what isn't. To share a read-only version of the board instead, create a Secret Link from the same menu. Now you can go and admire all of your hard work (or check out this finished example).